Summary: The New Testament contains some passages about dietary laws that can confuse us, if we don't understand them correctly. Part 2 of the Q&A helps us deal with these difficult Scriptures. This article continues where the previous Biblical Q&A left off: dealing with objections to obeying the dietary laws of Leviticus 11 and Deuteronomy 14. In this article, we will discuss three passages from the New Testament that we often misinterpret in regards to the dietary laws. Question 1: Romans 14:14 says, “there is nothing unclean of itself: but to him that esteemeth any thing to be unclean, to him it is unclean.” Was Paul saying that nothing is unclean? Paul is not dealing with a moral law here. He is calling for understanding of the tender consciences of weaker brothers.ii He advises “Let us not therefore judge one another any more: but judge this rather, that no man put a stumblingblock or an occasion to fall in his brother’s way” (Romans 14:13). Question 2: In Matthew 15:11 Jesus says, “Not that which goeth into the mouth defileth a man; but that which cometh out of the mouth, this defileth a man.” Does this mean we can eat whatever we want? Answer: There are consequences to everything we eat—good and bad. 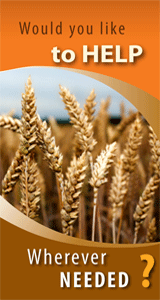 Eating poorly will harm our bodies, just as eating well will help our bodies maintain health. This verse needs to be understood in its proper context. It doesn’t mean that anything we eat is now good for us regardless of what it is, for we all know that there are many things that can go “into the mouth” and produce dire consequences. Many foods or drugs available to us harm us, and are not made safe to eat because of this verse. Question 3: Doesn’t 1 Timothy 4:3-4 tell us that we can eat anything if we pray over it first? Forbidding to marry, and commanding to abstain from meats, which God hath created to be received with thanksgiving of them which believe and know the truth. For every creature of God is good, and nothing to be refused, if it be received with thanksgiving (1 Timothy 4:3-4). Paul is telling Timothy about false believers who will “depart from the faith, giving heed to seducing spirits, and doctrines of devils” (1 Timothy 4:1). They are in error—no longer following the Scriptures. Paul tells Timothy these false teachers will command people to “abstain from meats.” But what kind of meats? 1 Timothy 4:3 tells us these are not unclean meats but meats that “God hath created to be received with thanksgiving.” This cannot mean unclean animals, because they were never intended to be eaten! These clean meats are to be “received with thanksgiving of them that believe and know the truth” (1 Timothy 4:3). Believe and know the truth about what? 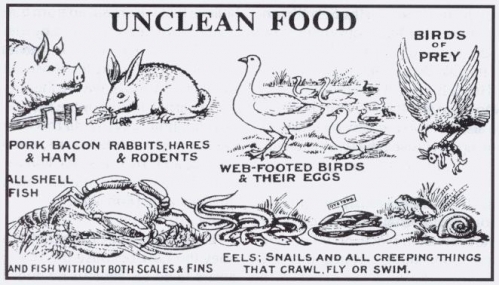 Obviously, the truth about clean and unclean animals. i. Bear in mind that when Paul says “nothing is unclean of itself,” he is saying that we can’t always tell just by our own judgment what is clean and unclean. It is determined by the Word of God. If a person feels that something is unclean, then the safe thing to do is avoid eating it since he does not have the faith to eat without scruples. Only knowledge of God’s Word can let our conscience rest in the fact that a particular food is clean or unclean. ii. Romans 14 speaks about esteeming “one day above another” as well as eating (or not eating) sacrificed foods. Both problems focused on observing festivals and sacrifices. Paul did not want new believers swept back into dead rituals because some “knowledgeable” person encouraged weaker brothers to view them as “harmless.” Paul wanted believers to pay special attention to problems with the weaker brother’s conscience. Paul was not telling believers to ignore either the Sabbath in the Ten Commandments, or the dietary laws laid down by the Creator since the days of Noah.